Titanic Movie, Rose Dawson Hat, Edwardian Period Attire in Stock. This Titanic Movie Rose Dawson Hat is just a sample of the Titanic Era, Edwardian Style Hats and Clothing we keep in stock. 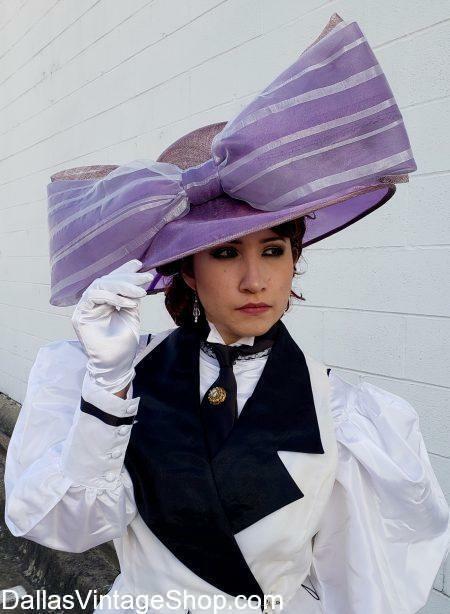 We are Dallas’ largest costume shop with this Titanic Movie Rose Dawson Hat and other Titanic Movie character costumes. You will also find all the Edwardian hats and period accessories you need. Yes, we have a large selection of Titanic Era Hats like this Rose Dawson Titanic Movie inspired hat and other Edwardian, Titanic Era hats & clothing for theme parties and theatrical wardrobes. This Kate Winslet Titanic Movie Rose Dawson Character hat recreation is in stock. You will find other gorgeous Edwardian and Victorian hats besides this Rose Dawson, Titanic Era hat. Our huge selection of beautiful hats and Costumes from Dallas Vintage Shop are always available for purchase. Prices range from supreme quality complete outfits to just the median & economy priced costume pieces or accessories you need. Keep in mind that the Titanic Movie inspired Rose Dawson, Kate Winslet, hat is just one sample of the Titanic Era and Edwardian style costumes & hats we keep in stock all year round. Posted in Rose Dawson | Comments Off on Titanic Movie, Rose Dawson Hat, Edwardian Period Attire in Stock. Rose Dawson Titanic Movie Costume. We have Victorian gowns, dresses, hats, gloves, cameos and other Victorian costume jewelry. We have an amazing selection of Pin Up Costume Accessories like these Polka Dot Parasols, Red Parasols, Purple Parasols White Frilly Parasols, Floral Print Parasols, and many other Fancy Parasols, Period Parasols, Victorian Parasols, Southern Bell Parasols, Steampunk Parasols, Little Bo Peep Parasols, Lace Parasols in many colors, Goth Parasols and many more. You are in Rose Dawson category.